This vase has a copper body with an applied silver rim and silver-base plate while the interior of the vessel is silver-gilt. The body of the vessel has been hammered to create a fish-roe effect (<i>nanak</i>o) and the dragon, on the lower part of the vessel, has been engraved. 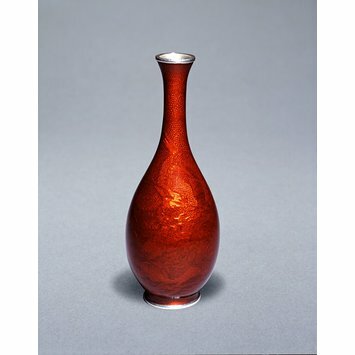 The vase has a standard copper body with an applied silver rim and silver base plate; the visible interior is silver-gilt. The body of the vase has been hammered to give a nanako ground and the lower part decorated with a hammered and engraved design of a dragon emerging from wild waves (the dragon in Japan is a water creature associated with both the sea and clouds.). 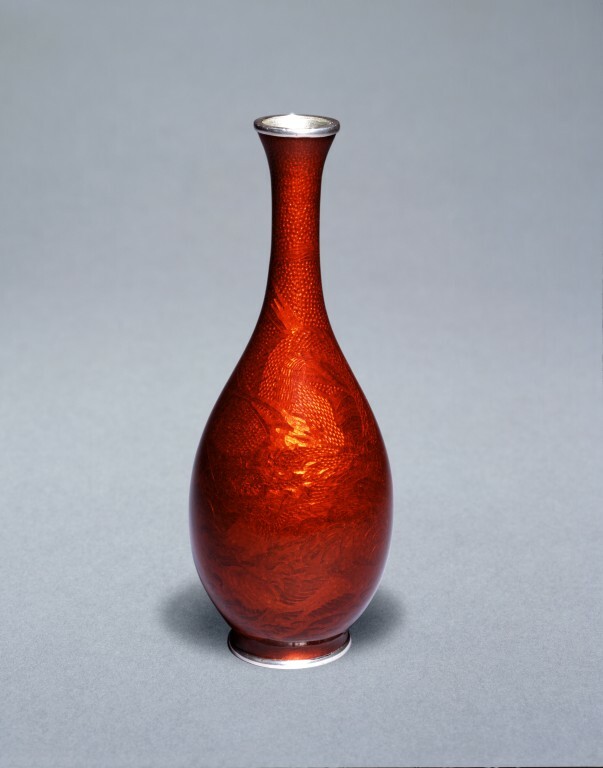 The vase is covered with the transparent red enamel in the technique known as akasuke. This type of enamelling is believed to have been invented around 1880 by Ota Jinnoei and Honda Yosaburo (Coben & Ferster p.132). The silver base plate carries the stamped mark of the Ando Company. This simple cross-shaped mark is based on the Japanese character for the number '10'. Pronounced ju, it is a homophone for the more intricate character used for the first part of the name of Jubei, the founder of the Ando Company. See also Coben & Ferster also plate 106 for a comparable piece by Hayakawa Komejiro. Cloisonné enamel vase decorated with a dragon. This vase has a copper body with an applied silver rim and silver-base plate while the interior of the vessel is silver-gilt. This vase has a copper body with an applied silver rim and silver-base plate while the interior of the vessel is silver-gilt. The body of the vessel has been hammered to create a fish-roe effect (nanako) and the dragon, on the lower part of the vessel, has been engraved. Mark of the Ando Company. Cloisonné enamel vase decorated with a dragon, mark of the Ando Company, Nagoya, Japan, c.1900. Irvine, Gregory. Japanese Cloisonné. (London:V&A Publications, 2006), p.54. Irvine, Gregory. Japanese Cloisonné Enamels. (London: V&A Publishing, 2011). pl. 51.